Narelle here. I’m delighted to welcome English author Clare Revell to Inspy Romance. Clare is one my lovely co-authors in ‘A Tuscan Legacy’ series. I’m Clare Revell, a British author. 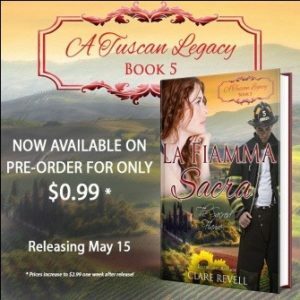 I wrote book 5 of A Tuscan Legacy – La Fiamma Sacra: The Sacred Flame. It tells the story of the second eldest Rossi – Ric and his downstairs neighbour Bracken. Like all the books in A Tuscan Legacy series, it’s based on a song. The version I prefer I can’t find on line anywhere—the Russell Watson version from his album Amore E Musica. But this one is a close second. Ric is a firefighter. Over here the shifts are vastly different to those in the US. Ric does 2 days, followed by 2 nights, followed by 4 days off. There are 4 watches per firehouse, known as Red, Blue, Green and White. However the dangers of the job remain the same. Every time the bells go off, there is a risk someone might not make it home again. Ric and Bracken live in Reading, which is where I live. 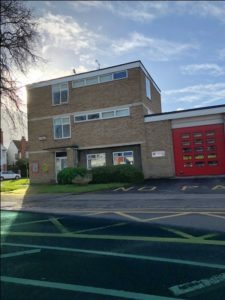 Ric’s fire station is my local one. 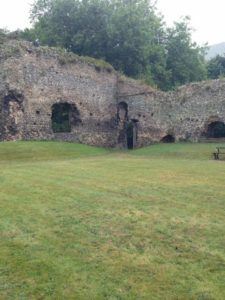 And the ruins of Reading Abbey which play an important part in the La Fiamma Sacra played an important part in my life as well. It might be the same part, you’ll have to read the book to find out. Before the trip in book one, Ric hadn’t been home for several years. He had a serious argument with his father and left. Honestly he says he doesn’t miss Italy – he’s fallen for the British weather, his cute neighbour, her adorable son and the British food. I can neither confirm nor deny that Ric’s cat is based on our cat. Although seriously, Ric’s cat is way friendlier than Tilly, who’s more of a people eater than a people person—not to mention a chair thief. Stand up for a second and Tilly sits there. Ric named his cat Schiaccianoci which means Nutcracker. It’s Noci for short. His favourite hymn is Everlasting Arms, which he sings a lot in the story. We learnt this one recently in church – yes they go to the same church that I do. The church away day is one we do each year. Bracken has long wavy red hair and a cute son Deforest who is six. Like her brother Rowan and sister Willow, they are named after trees – a tradition on her mother’s side of the family. Ric comes up with some great names for any children they might have…named after the things grown on the family farm in Tuscany. Some work, some don’t. Bracken was widowed when Deforest was a baby and is naturally scared of falling in love again, never mind with someone who literally throws himself in death’s way every time he goes to work. We have a website here and a series page here in the UK and US where you can find all the books. I’ve read 5 of them so far and they are all wonderful. You can find the book on the UK and US sites. Like Ric I wasn’t born in Reading, but if we hadn’t moved here when I was a teen, I’d never have met my husband. Perhaps things like that are more common to more of us than we realise. God has an overall plan for us, that we can’t see when looking at the little pieces. Has anything like that happened to you? Or maybe you have a pet with a weird habit or strange name. I have a Kindle copy of La Fiamma Sacra to give away to one commenter. The giveaway will close on Saturday and the winner announced in the Sunday Edition on April 22. Hi Narelle! Welcome Clare! Thanks for sharing background information on your upcoming book of A Tuscan Legacy – La Fiamma Sacra: The Sacred Flame. I especially enjoyed learning about firemen. Have some friends, who are local firemen. As a German American, I appreciate the rich European history and enjoy visiting and reading books about castles and castle ruins. As an avid reader, I find the name of the town delightful. Is it filled with Readers? I definitely believe that God has a plan for us. In college He lead me to a church, where I met my husband. In our moves he opened doors to teaching jobs, so we could retire comfortably. We have also had pet with some weird habits. Our cat Mimi every summer liked to catch one bird, which she didn’t kill, just held in her month till we acknowledged what a great hunter she was and gave her a treat. The birds were stunned, but always managed to fly away once she dropped them at the back door. I have preordered all books in the series. No need to include me in the giveaway. Best wishes and Happy Writing. Thank you very much for commenting, Renate, and huge thanks for pre-ordering our series! I loved the story about your cat Mimi. How interesting! Thank you for sharing. Hi Narelle:) Thanks Clare for the intro to your book- I am excited about the series and am anticipating release dates. We moved from a country town to a capital city when I was about to start my last 2 years of high school- it was AWFUL at the time, but looking back, I firmly believe it was the best thing that could have happened- it led me to studying at a particular uni where I met my husband which was the best thing!! Nice introduction to the book. I look forward to reading the series. Hi Narelle and Clare. This sounds like another great book in the series. Deforest is an interesting name for a person! thanks for talking about the books. these sound fascinating. How interesting that names are from trees. I enjoyed reading about the book. I never thought of Bracken as the name of a tree… what we call bracken here in California is a small plant that looks like a fern! I’m looking forward to the series. We’ve had very affectionate female rabbits who loved to get petted. We had a three legged gerbil who would jump out of his cage,a 10 gallon glass tank, and into your hands. Only having three working legs never slowed him down. One of his legs was shriveled when we bought him at the pet store. I didn’t notice it until we got home. My daughter said that was why she picked him. She thought no one else would want him. Hello Diana! What abeautiful story about your pet, and you have a very kind daughter! Thanks for visiting Inspy Romance, Clare! We sure do weave a lot of ourselves into our stories, don’t we! Thank you very much for sharing about your book and the story behind it, Clare! And it was interesting to learn more about firefighters in UK. Thanks for the great post! The book and the entire series sound fantastic! I followed a twitter link to this blog. So fun. Great post. America has lots of immigrants. It’s fun to hear about immigrants in the UK. I’ve always loved inspirational fiction. Writing it is especially fulfilling. Thanks for sharing. Your book sounds like a fun read.